Today I have for you a newer product from Milani. This is Milani Lip Intense Liquid Color in 03 Fiery Coral. Milani calls this a heavily pigmented high shine gloss with the longevity of a lipstick. It is paraben free, cruelty free but not vegan. Milani Lip Intense Liquid Lip Color is available at various drugstores and larger mass retailers that carry Milani and on the Milani website. I bought mine at my local CVS and I paid $6.29 for 0.20 fl. oz/6mL of product in a sleek, torpedo shaped hot coral pink and gold tube. The colour of the tube corresponds to the shade of the lip product contained within. The tube is so pretty, all pink and gold but boy! Is that all of that reflective gold a bear to photograph! Swatch on the back of my hand. Check out the rich, densely pigmented formula. It is also smooth and glossy, especially initially. On my lips. So pretty. I have to say, I love, love, love that hot pink coral! Sadly, for me that is where the love affair ended. I read so many rave reviews of this product, that so many bloggers loved it, how it applied so smoothly, that a tiny bit covered so flawlessly, wore a long time and was comfortable and even moisturizing that I just knew that I was going to adore it, also. I didn't have that experience with this product. To get look you see in the above photograph, I had to pile the lip colour on. The small amount others said that they needed resulted in just a streaky, thin coat that didn't begin to cover my naturally deeply pigmented lips. It took me a long time and a lot of work to get this smooth, even application. Once the photographs were taken, I wore this for a while and the results were very disappointing. With wear, the lip colour broke up, fell apart, wore unevenly. Initially, it felt nice, smooth and moist on my lips. But after a very short while it began to feel oily, slippery and it felt as if it was trying to run away from me. 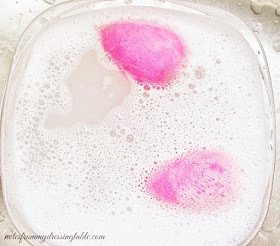 Between the oily, slippery feel and the breakup I was worrying this and fussing with it, trying to keep it smooth and even and in place and looking as I felt it should and I wasn't happy. What was I doing wrong? Surely it was me? Surely it was my fault? After a couple of frustrating hours of fighting with this product, I removed it and applied lip balm to soothe my offended lips. 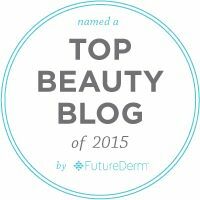 I got some feedback on this product from other bloggers and I gave it another chance a day or two later. I applied it again, wore it longer, tried not to worry it, It traveled up above my upper lip on the left side, (happily I wasn't wearing makeup that day!) It wore unevenly, again and as time wore on, it dried my poor lips out terribly. By the time I removed it, my lips were yelling at me to never put that stuff back on them, again. I so very, very much wanted to love this product! I bought the Milani Lip Intense Liquid Color in Fiery Coral because I saw so many others loving it and I fully expected to love it, too. I am disappointed that I do not. I did adore the colour! I was pleasantly surprised at how much I loved that bright, hot pink-coral shade and I fully intend to buy other lip products in that shade. I think it really does look good on me. Okay, in the interest of full disclosure, I did a little basic, very amateurish airbrushing. I lightened up my insane dark circles a bit and the red spots on the sides of my poor offended nose where my glasses hurt. Otherwise, no photo editing was done, save sharpening, because I am a shaky ole broad. 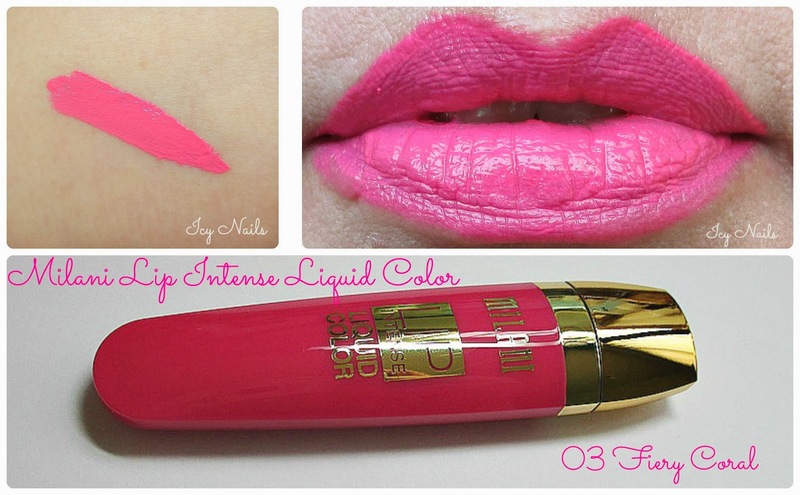 What do you think of the Milani Lip Intense Liquid Color? Did you pick it up? Do you love it? I know that a lot of people do. If you do, feel free to gush on in a comment. I really do like to hear the good about things, even when they aren't the best for me. I am going to take this lip colour back to the store with my receipt, return it and try something else. Maybe they will have the new rose blushes... They never got them, last year. They did finally get the neutral shadow sticks! You know... The ones that everyone was all goo-goo over last year? Small towns. Pffft! Maybe I'll grab one or two of those and give them a whirl. They are supposed to be really good and I am a raging eyeshadow ho. Some people go for blushes, others are all about the lipsticks. Me? It's eyeshadows. I love me some eyeshadows. All the pretty, pretty eyeshadows. Singles. Sticks. Pots. Palettes... I see new eyeshadows and I am a goner. Thank you so much for popping in, spending a little time with me and reading my review. Take care of your self and have a beautiful day! I kinda wish you'd posted the pix of the lippie traveling up your lip.. I imagine it crawling and oozing. It's alive!! LOL. THAT color is fiery coral? really? It's like a bubblegum pink to me. That color does look good on you, but I don't see it as coral. Also, no color is worth that much fuss. I love that color, I love pink and Spring! So bummed you had a bad experience with it. The color is gorgeous on you! That is a HOT color on you girlie! Thank you. :D That was my own experience... Others had a better result. Some bloggers got six and even eight hours. Maybe I'm defective! Hee hee! I'm so sorry it didn't work out for you! Take note of this shade though so you can invest in it gain from another line! It looks great! Its a great shade and its amazing that its so pigmented! Aww sorry it didn't work for you! I think it's gorgeous. Oh, I'm sorry to hear it didn't work out for you! I'm sorry this didn't work out for you! The color is lovely though! Very pretty color, too bad it didn't work out for you. I bought this lippie in another shade and loving it so far! I am so looking forward to trying these out. Milani is a very favorite for lippies. Such a shame... I really do think you might have gotten a bad tube. Write milani!! Too bad it didn't work for you. I was expecting a bright coral. This reminds me of Kat Von D liquid lipstick, everyone was raving about it but it was an utter disappointment for me.... could be our lips pH 'tho. the color looks great on you. If it's got formula problems, I'm not sure how eager I am to try them. oh my gosh, so beautiful! What a bummer! I love these lip intense lippies. I have a few shades. Some days they go on like a breeze & other days require a little more effort. I apply Milani's new transparent lipliner first. I adore how lightweight this product is! And on me, it lasts for hours if I don't eat a meal etc. so sorry it doesn't work for you. Love the shade on you! Eh, you win some, you lose some. :) I do love the colour and will get it in other formulas. :) Thank you for your kind words. It is and I am bummed it didn't work for me.